Every summer we seem to grow loads and loads of squash and zucchini. I love to sautee them in with a little butter and salt and pepper but this is another wonderful way to serve them that I think you will enjoy. 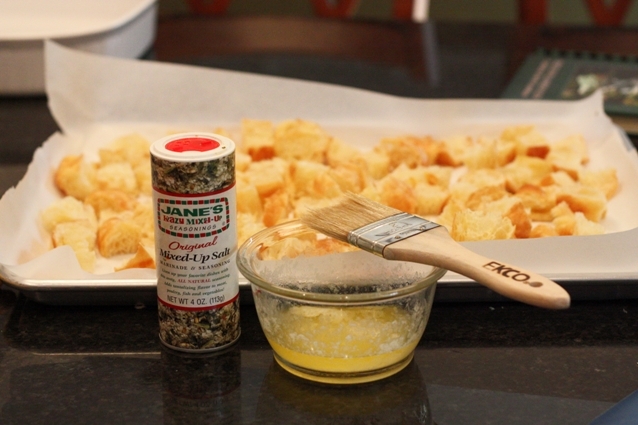 It is made with homemade croutons. We had it when Shireen and Russell were here a few weeks ago and they both loved it and deemed it “blog worthy”! CLICK ON THIS LINK to print the recipe. Yummm. Looks good! Hope everything is going well!! YUM! I am going to try it. This is our second year growing vegetables and herbs. Every year, we plan to grow our garden a little more in square feet! Last year, it was just a few pepper plants and basil sprouts in terra cotta pots. This year it's a little plot of land with arugula, carrots, beans, peppers, thyme, oregano, and basil… I LOVE your recipes! This makes me hungry! It looks delicious! I also love to sautee squash and zucchini…we had some last night with dinner. Can't wait to try this recipe. with all that zucchini…pah-leeeeze go to my blog and make the zucchini bread recipe. you will NOT be sorry. and neither will your kids!! Yummy! Thanks for the recipe. I love squash! 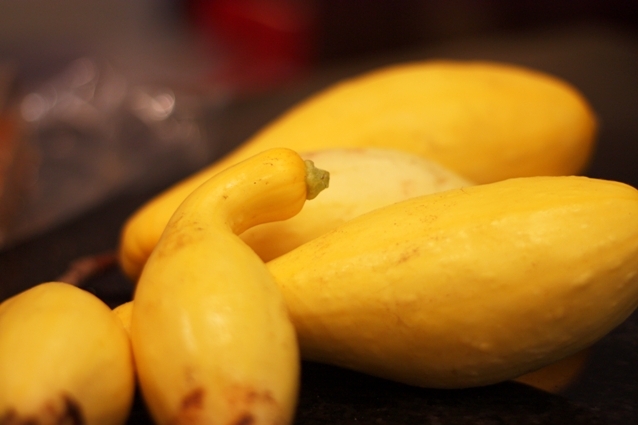 ahh…summer squash…so yummy!! Always reminds me of my grandmothers house on Cape Cod, she would make it every time we would visit. I don't grow my own veggies, but I'm always interested in a good way too cook squash other than on the grill. This looks so good! Perfect for using up all of those squash! Unfortuanately I'm going to have to wait about 6 more weeks to try this since the squash in Maine aren't mature until then. Thanks for the recipe. I have been wanting a squash casserole recipe for a while now…especially since we are growing squash this year. We don't have any to harvest yet but hopefully will in the coming weeks. Thanks for the yummy recipe! We always have lots of squash during the summer. I discovered Smitten & Co. through your blog and ordered a "big bro" t-shirt for our 14-month old. It was a perfect way to annouce a new addition to our family! Thanks for the reference! i planted squash and zucchini this year and so far have nothing. they bloom everyday, then nothing ever grows. what am i doing wrong??!! 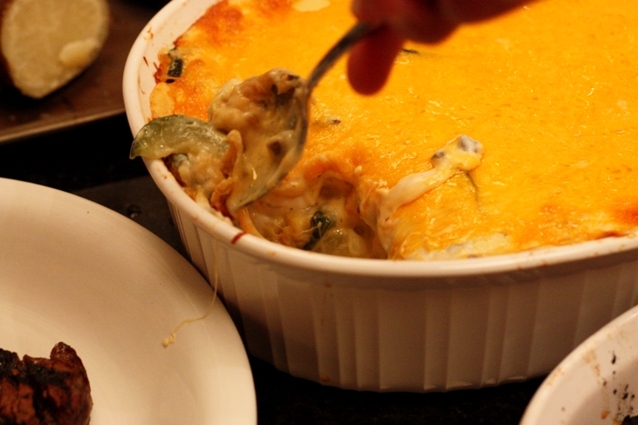 Yum, we always enjoy squash casserole! Thanks for sharing. This looks so good. I just wanted to pop out from the blogsphere and tell you how much I LOVE your blog. Everything from your Christian values, amazing pictures and stories. Thanks for sharing! I think something fun you could do is ask ONLY people who have NEVER left a comment to leave a comment on a post. Maybe you could ask a question about them. totally yummy! My friend Connie made Summer squash for me one time. She's a health nut. She took a summer squash and poked holes in it and popped it in the microwave for 10 minutes. Sliced it in half, scraped the insides out (minus the seeds) It looks like ,,,oh wait, that was spaghetti squash. anyway, scratch that, scraped the spaghetti squash (minus the seeds) out into a bowl and drizzled it with garlic and olive oil. oh and a little sea salt and topped it with fresh parmesan. yummy! Great substitution for pasta. yum, yum, we are on our 3rd batch of banana bars here too! Oh. my. This looks sinful!! Lucky you to already have summer squash! We are just getting the first few baby squash here in Athens. We just made this from squash from our garden. It was sooo good. Even guests that didn't like squash tasted it and raved about it!!! 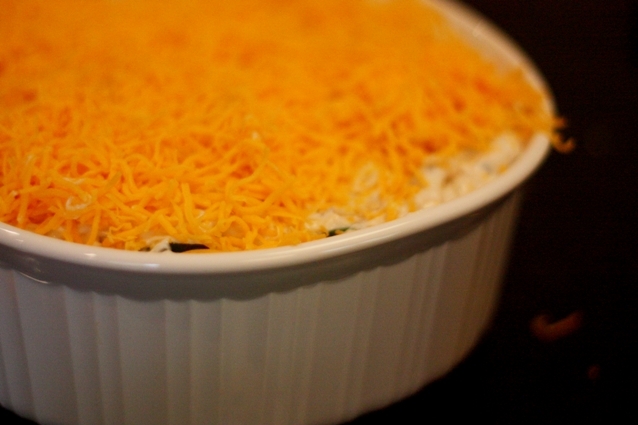 Made your squash casserole tonight–it was a hit! Thanks for sharing your recipe. i am a total rookie in the kitchen, so forgive the stupid question. do you cut the squash before boiling/steaming it or leave it whole? by computer, we have worked with Canadian nonprofits.